There are plenty of adventure travel companies out there, but Classic Journeys seems to have found and refined its own niche: tours that combine cultural immersion with physical activity in some of the most delightful locations in the world. What’s more, many of these trips can handily fit into a week-long time period, making them ideal for the time-pressed among us. I recently had a chance to ask company founder Edward Piegza about what makes Classic Journeys unique in a crowded marketplace. What are the origins of Classic Journeys? My “aha” moment was in realizing that we could use walking as a means rather than an end. “Let’s create trips with strong cultural and historic elements, and use moderate, manageable walks as the way to get close to the local people and see things you don’t see when you’re on a forced march or a big motor coach.” That’s how we created our first Cultural Walking Adventure, and it’s the principle we still apply to all of the itineraries we have in 2011. We just celebrated our 15th Anniversary, but the idea of the company is a few years older than that. I already had a lot of experience with fairly intense walking tours, like coast-to-coast treks in northern England. But “intense” was the key word. I knew a lot of good travelers who were happy to go for a walk and who loved being out in the country, meeting the locals. At the same time, I felt that there was a limit to how many of them were willing to sink knee-deep into a bog or trek through nettles to make it happen. I realized it was a new niche: people who wanted to exercise their imaginations as much as their bodies. 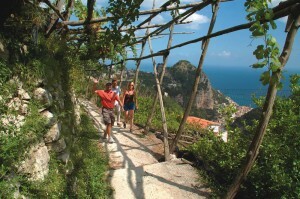 Walking in the Cinque Terre. What do you bring to the table in terms of expertise? After spending a few years as a banker (what was I thinking? ), I’ve been in the travel business for almost 20 years. In addition to our headquarters operation, we have about 175 local guides around the world, many of whom have been with us since the beginning. I like to say that we built a major social network 15 years before it became a hot idea. We have native resources on the ground in every one of the 68 regions in 31 countries on 5 continents where we take our guests. Instead of coming in from California and imposing a trip on a region, we have the resources to start from the ground up and construct an experience-based itinerary that immerses a guest in the culture and really captures the essence of the place. How would you characterize the Classic Journeys approach to adventure travel – and how does it differ from the competition? Like I said, we’ve been different from the start. Our unique brand of adventure travel is what we call a Cultural Walking Adventure. For us, the cultural experiences are where the real adventure lies. It’s not that we don’t go river rafting in Costa Rica or camel-riding in Morocco. But a Classic Journey is never primarily about the physical adventure. It’s about the life of the place we’re visiting. Another huge difference is how we empower our local guides. Of course, we have established itineraries, but our guides have tremendous flexibility that other travel companies don’t allow. We always want our travelers to be able to take advantage of the copacetic things that happen when you travel. If we get an impromptu invitation into a farmer’s home, or if a major local festival happens to coincide with a village visit, we go for it. It keeps the trips spontaneous and fresh, and that’s everything to us. How about your travelers – who are they, what are they like, how experienced are they in roaming the world? Demographically, they’re mid-40s to late 60s (though I also like to say we’re very strong among 8 to 15-year-olds thanks to Family Journeys). Our guests are generally professional and urban. The most relevant distinguishing characteristic is that Classic Journeys’ guests are very experienced, independent travelers. They’ve been around. They’ve seen the marquee sights. They’ve gotten lost in their Italian rental cars and ordered the tripe by accident. They tell us that they like our approach because they still get the kind of rich experiences they always looked for on their own, but they are happy to have us handling the logistics. You offer family trips – tell us about them, and where they go. We offer 17 Family Journeys to destinations from Tuscany, Amalfi, Provence, Croatia and Ireland to Costa Rica, Morocco, Peru and Montana’s Glacier Park. I have two kids of my own—now 11 and 13. We’ve traveled with them since they were toddlers, and my experiences are behind the Family Journeys approach. 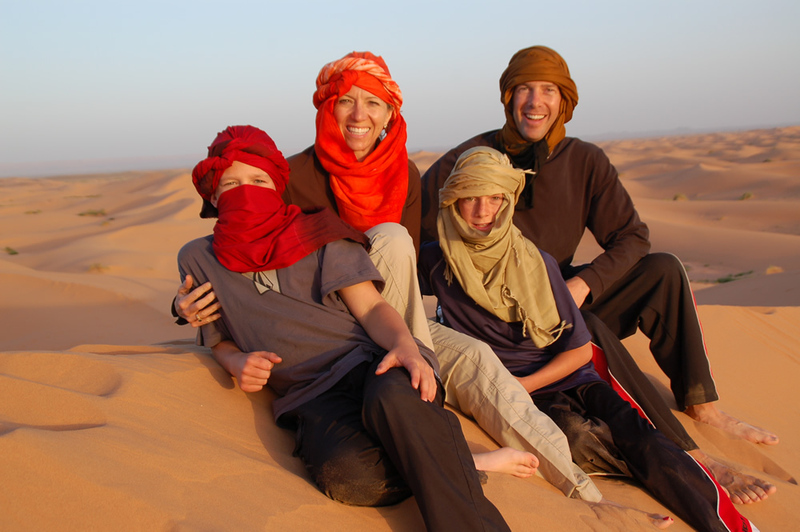 All Family Journeys are hosted by multiple local guides, one for the adults and one for the younger generations. That lets us provide a vacation that everybody can love. The kids don’t get bored by parental activities. The parents get a real vacation without having to sacrifice everything to keep the kids happy. Everybody comes together for experiences they all enjoy together. We’re big advocates of exposing young travelers to different cultures and experiences. Family travel is now 30% of our business and all indications are that it will continue to grow. You also offer culinary programs? Classic Journeys runs Culinary Tours in Tuscany, the Amalfi Coast, Provence and Napa. The experiences all include several cooking instructions in private and professional kitchens. Unlike a lot of tours in this category, they’re not just about cooking. We get to markets, olive mills, and vineyards. We meet cheese makers, bakers and patissiers. Guests also eat incredible meals as well. And we also balance the culinary aspects with plenty of walks and other cultural experiences. The walks help us work off some of the calories. The itineraries are specifically designed so that a traveling companion who’s not into cooking can have a fantastic time. 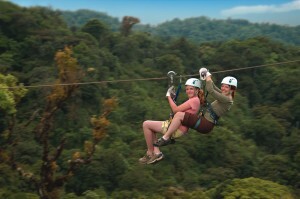 A mother and daughter zip-lining in Costa Rica. How is adventure travel changing, in an increasingly frenetic world dealing with recession worries and lack of free time? One of the biggest shifts we see is toward customized travel. Given current economic conditions that may sound contrarian, but it’s not really. Travel time is scarce. Guests may not take as many vacations as in the past. And they want to be sure they get exactly what they want out of their trip. We’ve been addressing those needs by expanding the number of Private Journeys we create. 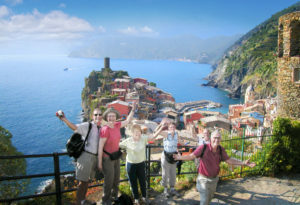 The customization can be as simple as running one of our itineraries “as is” on a schedule that works for the guest. At the same time, we’re also set up to tailor our trips as extensively as a group wants. Right now, we’re creating a 27-person version of our Costa Rican itinerary for an family celebrating a 50th anniversary. In addition to tweaks to the usual day-by-day, we’ve also added an extension to the Galapagos. We work hard to keep the pricing premiums to a minimum so that the package stays affordable and costs less than if the group had the time and knowledge to arrange the same tour independently. Any new destinations for Classic Journeys this coming year? We’re going to Montenegro! It’s such a great destination, right on the Adriatic with fantastic seaside villages as well as spectacular mountains. The itinerary includes luxury resorts, a mountaintop day with a shepherd family, lake cruises with great birding, and a lot more. A few years ago, Croatia really opened up the idea of traveling in the Balkans. Our journeys to the Dalmatian Coast and the Istrian Peninsula remain some of our most popular. We think Montenegro has the same kind of appeal—made all the more exciting because it’s not on most travelers’ radar screens. The experience is as authentic as it gets, and that’s what our guests value most. What places are on your personal travel wish list? I’d fly off to Cuba in a second if I could. I love the idea of this place that’s so nearby, but not familiar. It’s one of the ways that I’m a lot like our primary guests: I love discovery, that sense that I’m having travel moments that most people have never had. I didn’t get a chance to personally do our scouting in India and China, so they’re high on my list too. I like the Indian contrasts: we walk to rural villages and stay in some of the world’s top 10 hotels on the same trip. In China, we go to Shangri-La, which is tribal Tibetan territory in the foothills of the Himalayas. I’ll be happy once I’ve had my first cup of yak butter tea. And when you’re not working, where do you find your center of gravity? Easy answer. It’s all about my family. I’m especially involved in coaching the boys’ athletic teams. Some people think it sounds like a busman’s holiday. I spend my days managing international operations at Classic Journeys, and my evenings and weekends coaching the kids and sharing these intense moments with them. But I guess it’s a big theme of my life: show me an interested group of people who share a goal—winning a baseball game or exploring Machu Picchu—and it makes me so happy to jump in and make it happen.